Bleacher & Railing Fall Lawyers | Davis Law Group, P.S. In recent years, the safety standards for construction and maintenance of bleachers has greatly improved. 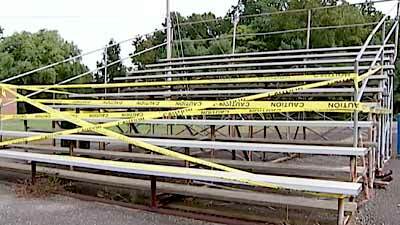 After decades of negligence, most schools and parks have taken steps to curtail the number of accidents and injuries caused by bleachers. But bleacher falls and accidents continue to occur, oftentimes on old and faulty bleachers that were constructed prior to the release of the new standards. If these bleachers have not been retrofitted or replaced by up-to-date bleachers and railings, the entity in charge may be subject to a lawsuit in the event of an accident. If you or a loved one has suffered an injury due to a bleacher or railing accident, you’re likely facing high medical expenses and a great deal of suffering. Contact an attorney at Davis Law Group today for a free case evaluation. Call (206) 727-4000, use the chat feature below or fill out the form on this page. In the years between 1980 and 1999, there were a total of 10 reported deaths as a result of people falling from stadium bleachers in the United States. The U.S. Consumer Product Safety Commission (CPSC) reports that children under the age of 15 were victims in 4 of those cases (40%). Between 1991 and 1999, the CSPC says there were more than 19,000 bleacher-related injuries to children that required emergency-room treatment throughout the United States. In 1999 alone, an estimated 22,000 children were injured in falls from bleachers throughout the country, prompting a series of CPSC roundtable discussions on improving the safety of bleachers and grandstands. While there is limited data about changes in incident rates for bleacher-related injuries, the CPSC’s safety improvement recommendations have undoubtedly reduced the chances of a child being seriously injured in one of these falls. But still, it is estimated that more than 15,000 children under the age of 15 are injured in bleacher-related accidents every year nationwide. In 2014, the Toppenish School District agreed to pay a $6.9 million settlement to the family of an infant child who fell through a set of bleachers during a soccer game in 2007. According to news reports and court documents related to the lawsuit, the child fell through the 7.5-inch gap between the rows of bleachers at Toppenish Middle School in September of 2007. She allegedly fell 13 feet below the bleachers and landed on her head on the cement floor. The baby was hospitalized for almost a month and underwent several surgeries. The girl suffered lifelong debilitating injuries. Despite the fact that the school district has agreed to pay a substantial settlement to the family of the injured child, official statements from school representatives continue to deny any liability for the injuries the girl suffered. Although the CPSC’s recommendations for retrofitting bleachers to be safer for children have been available to the public since 1999, tens of thousands of these preventable incidents continue to victimize children every year in the U.S.
Who is held responsible for a child’s injuries from a bleacher-related accident is dependent upon the nature the incident in question. In an instance where defective bleachers or grandstands led to a child’s injuries, then the manufacturer could potentially be held liable for the damages that resulted. A property owner or management company that fails to adequately retrofit or replace bleachers to match industry standards and municipal codes could also be held liable for a person’s bodily injuries. To discuss the specifics of your particular case, contact Davis Law Group at (206) 727-4000. The construction and maintenance of bleachers must accommodate the needs of spectators of different ages, weights and heights. If this duty of care by the organization in charge is breached, a lawsuit may be brought against them. Tripping. People may be injured as a result of a trip over a step when entering or exiting the bleachers. Slip and fall. There should be adequate traction on the bleachers in case rain, ice or snow make them wet. Tipping over. Overcrowding or improper weight distribution may cause the entire section of stands to tip over. Lack of railings. Bleachers should have proper guardrails on the side and back to prevent people from falling off. Collapse. Older bleachers may break down and rot, causing them to collapse under pressure. Openings under seats. Older bleacher designs include openings for small children to fall under the bleachers. If your child – or the child of a close friend or family member – is one of the tens of thousands of children who have been injured in falls from bleachers or grandstands throughout the United States every year, it may be in your best interest to consult with a personal injury attorney who has experience in handling child injury claims. Attorney Chris Davis literally wrote the book on child injury claims, as he published Little Kids, Big Accidents: What Every Parent Should Know About Children & Accidents in 2008, and has represented child accident victims and their families throughout Washington state for over 20 years. Fill out the contact form on the right or contact our office at (206) 727-4000 to have your case confidentially reviewed by Mr. Davis, and to schedule a no-obligation consultation with Davis Law Group in our downtown Seattle office.